Rain always makes me pensive, and I was ruminating on a couple of things that have happened to me over the course of the last three months that I’ve been doing my absolute best to live a zero-waste or low-waste lifestyle. It’s a daily struggle; I went without water for eight hours yesterday because I was too stubborn to buy a plastic water bottle and we never stopped running 9-1-1 calls long enough to fill up my reusable Klean Kanteen. Healthy? Negative. Zero waste? Abso-freaking-lutely. Today I am writing about being an ambassador for change. I feel like part of taking on this challenge is also promoting this challenge in today’s world. That doesn’t mean that I’m running around knocking plastic water bottles out of peoples’ hands and screaming “PLASTIC BAD!!! !” or anything, but merely that when approached or given an opportunity, I will attempt to educate or promote what I’m doing. Amy talks a little about this in her Zero Waste lifestyle book, and she says some pretty funny things about it. People’s reactions to your bizarre requests to eliminate waste, as I have discovered, due tend to run the gamut. I’m run into everything from muttered swearing (f*ckin hippies) to curiosity to outright acceptance. One of my personal favorites was the superintendent of trash at the Los Angeles facility I visited in my quest for honest recycling. I marched up to him in typical Katie fashion and wanted to know if I could give him my recyclables. He cocked his head to one side and said, “Well, you could, but why don’t you just put them in your blue bin [LA City curbside recycling] and we will collect them? Save you a drive…” When I explained Athens Waste Management and their shady co-mingled trash and recycling (I refuse to believe they are actually recycling all of my food-encrusted recyclables), he acquiesced to collecting my recyclables personally and making sure they made it on the appropriate truck. But more than harassing innocent public works employees, I’m often surprised and heartened by ordinary people’s reactions. In all of its purple glory…with its plastic-free, stainless steel lid with sustainable bamboo on top! And Victor and I went on to extol the virtues of Klean Kanteens, both zero-waste and health philosophies (no landfill waste produced and absolutely plastic-free, so no chemicals leaching into your body). 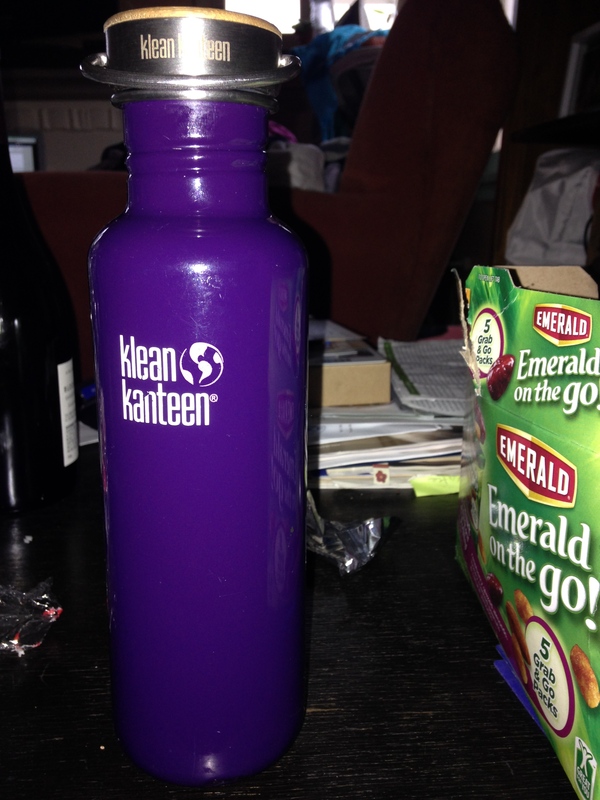 And the nice lady left inspired and educated, intending to purchase a Klean Kanteen for herself. In a separate experience, when I was at work one day, I had the opportunity to trot out my knowledge on plastics recycling and how much shorter the plastics life cycle is than what I thought it was. Because I work in EMS with a bunch of old-school guys who still think women belong in the kitchen and not the ambulance and still eat TV dinners out of plastic trays at home, I was bracing for the barrage of insults and raspberries I was sure was coming my way. But I was pleasantly surprised. One guy had heard about the plastics life cycle, and another was shocked and a little unsettled to find out about bioaccumulation of organic toxins in fish and other marine life that have swallowed micro plastics. You can read more about this in my post on landfill. So, my pensive thought for the day is that people are more flexible of mind than you think they are, and although it takes courage to stand against the tide of plastic and landfill-bound waste, it’s also interesting to watch people learn through your experiences and maybe even adopt some of the things that you are doing. ← Hard Cider for the WIN.